Stock photo of car tire in the harbour in the town of Great Brehat along Highway 430-76, Viking Trail, Trails to the Vikings, Great Northern Peninsula, Northern Peninsula, Newfoundland, Canada. This stock photo shows a car tire laying in the harbour in the fishing town of Great Brehat along Highway 430-76, Viking Trail, Trails to the Vikings, Great Northern Peninsula, Northern Peninsula, Newfoundland, Canada. 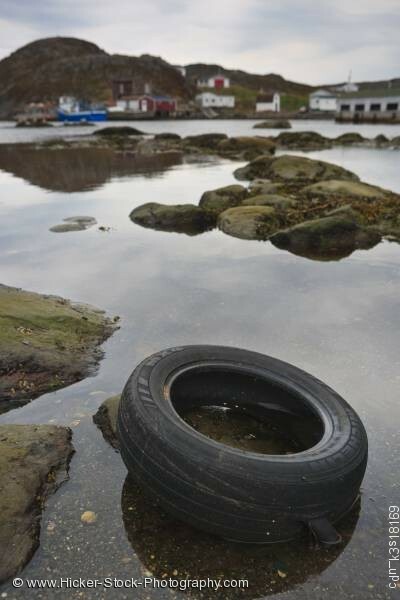 A car tire lays on a rock in the harbour in the town of Great Brehat. This tire has been discarded in the shallow waters of the harbour. The tire disrupts the charm of the harbour town of Great Brehat. The small fishing town sits in the distance of the harbour’s rocky shallow waters. Fishing boats are docked along the shoreline leading to the small homes and buildings along the rough hillside of the town. Car Tire in the harbour in the town of Great Brehat along Highway 430-76, Viking Trail, Trails to the Vikings, Great Northern Peninsula, Northern Peninsula, Newfoundland, Canada.